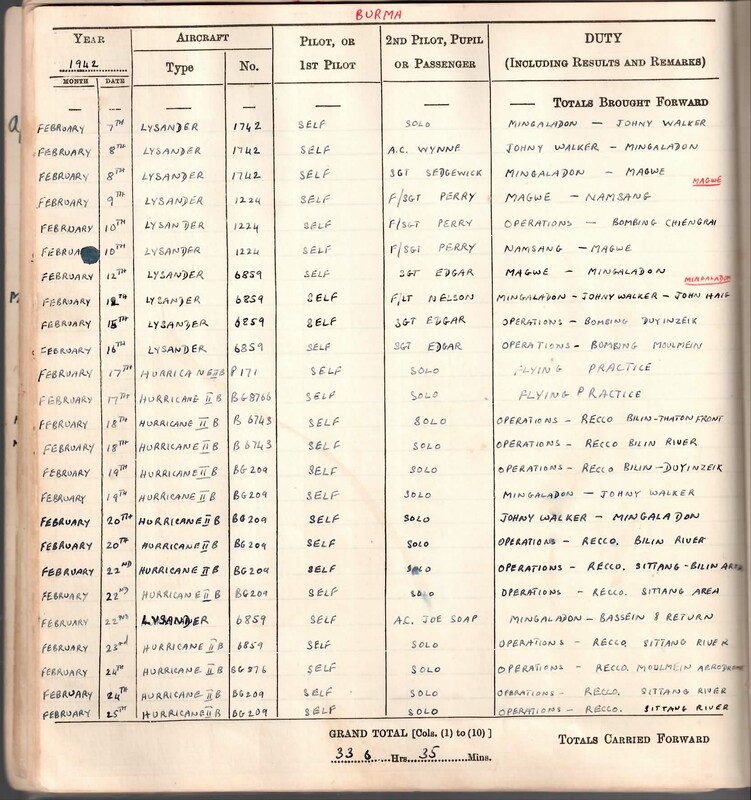 Below are some scans from my father’s Log Book. I will try and add to them over time as I scan relevant sections. 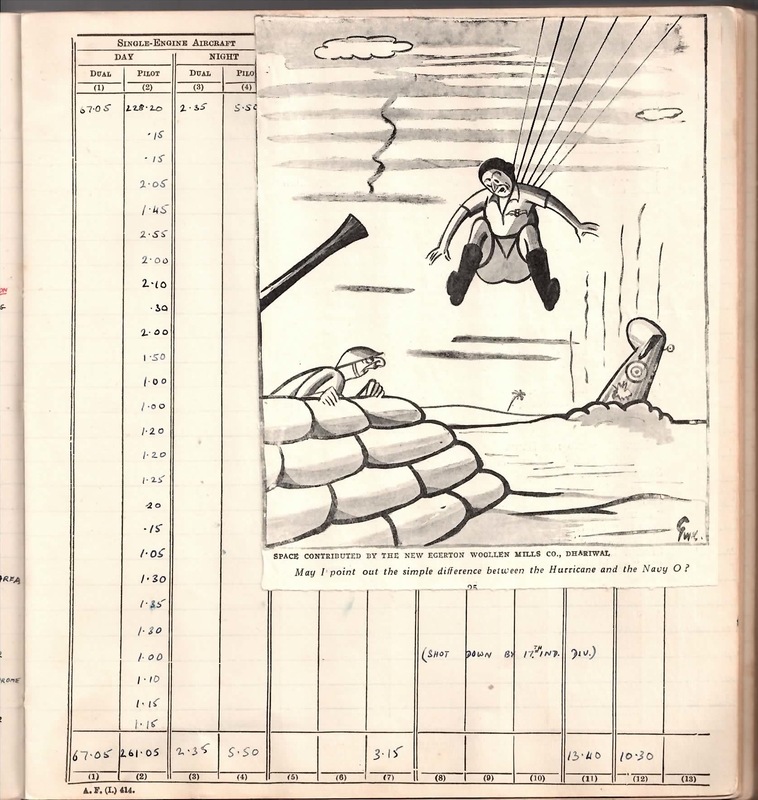 The first two extracts cover the Habbaniya battle in Iraq in May 1941, his first taste of action in the air when still a pupil pilot, and the second two are from Burma, and cover the day he got shot down by the (friendly) 17th Indian Division. He’s pasted a rather ironic cartoon clipping from the period into the log book. Will you be adding more logbook pages soon??? Hi there – had no plans to, as I was just adding pages that were significant – ie relating to particular actions. The problem is it is pretty time consuming to scan and upload. However, if you think it would be worthwhile, I will allocate some time to try and get it done! Hi. 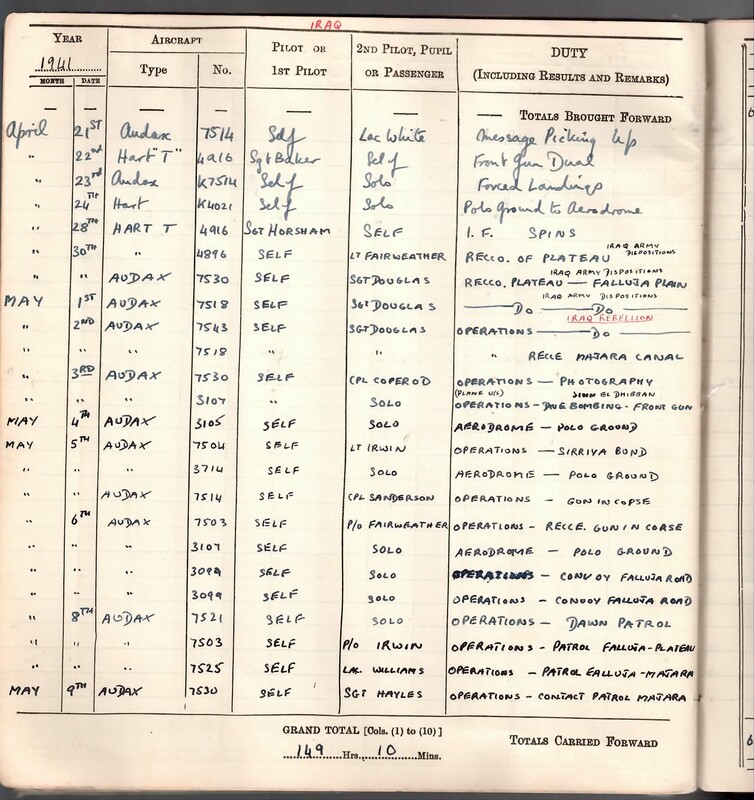 I for one would enjoy seeing the whole logbook, but especially the parts where he flew Hurricanes and Spitfire as I research these a/c and the pilots who flew them. OK, I will get them up soon, though may take me a month or so. I am still very interested in more logbook pages…. Thanks for reminding me. Any particular dates or sections? Basically I am interested in every flight he made in Hurricanes (and Spitfires if any). So it is hard to pick a certain period. 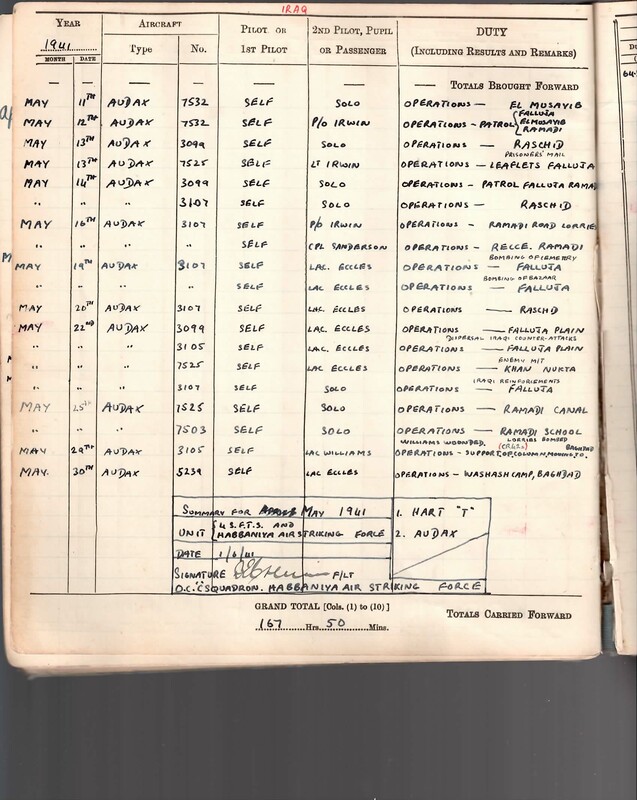 Thank you so much for sharing the details from your father’s logbooks and wartime experiences, particularly the “forgotten” battle for Habbaniyah in May 1941. I’ve been fascinated with the story of the Iraq revolt ever since reading Tony Dudgeon’s book Hidden Victory”. Apart from the photo of Hart trainer K4900, are serial numbers identifiable on any of the other photos? I don’t know if you have any other pics of aircraft at Habbaniyah in March/April/May 1941 but I, for one, would love to see them. The 4 FTS aircrew and groundcrew accomplished such amazing things with their rag-tag collection of training aircraft – Oxfords, Audaxes, Gordons – simply incredible!